Kevin Bridges is one of the UK’s best loved comedians who has even been described as “brilliant” by one of his idols, Billy Connolly. Bridges rose to fame following an appearance on Michael McIntyre’s Comedy Roadshow and has since become a regular on panel shows such as Mock The Week and 8 Out Of 10 Cats. His tours always sell-out, with 2012’s ‘Kevin Bridges – The Story Continues’ smashing box office records by selling a phenomenal 45,000 tickets of the first day. The tour also saw Kevin perform nine shows at the Glasgow SECC Arena, as well as a run across Australia. Kevin returns in 2015 with a brand new show, ‘A Whole Different Story’. 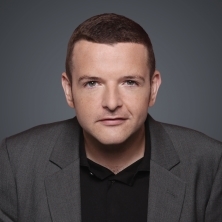 Eventim is the place to look for Kevin Bridges tickets and tour dates. To be the first to hear when more Kevin Bridges tickets go on sale you can sign up to the Eventim Ticket Alarm below. Despite having not set foot in a comedy club before his first open mic spot in 2004, Kevin's natural gift for comedy ensured he quickly became a regular at major comedy clubs up and down the country including The Comedy Store, The Stand, The Glee Club, and Jongleurs. Kevin appeared on "The World Stands Up" and "The Comedy Store" (Comedy Central) which led to his first big TV break as a guest on the first series of "Michael McIntyre's Comedy Roadshow" on BBC ONE, which aired to over 5 million viewers. It led to Kevin being the fastest act to sell out all 28 nights of his 2009 Edinburgh Festival run and adding a staggering 15 extra shows, which also sold out! A favourite with the punters but also the critics, Kevin received 5 star reviews and a nomination for the prestigious Edinburgh Comedy Awards "Best Newcomer". Kevi's astonishing rise to success continued in 2010 - he recorded his debut DVD at a sold out Glasgow SECC arena in front of 10,000 fans, became a regular on hit new comedy show "Stand Up For The Week" (Channel 4), headlined the first episode in the second series of "Michael McIntyre's Comedy Roadshow" (BBC ONE) and also hosted an episode of the forthcoming sixth series of "Live At The Apollo" (BBC ONE).